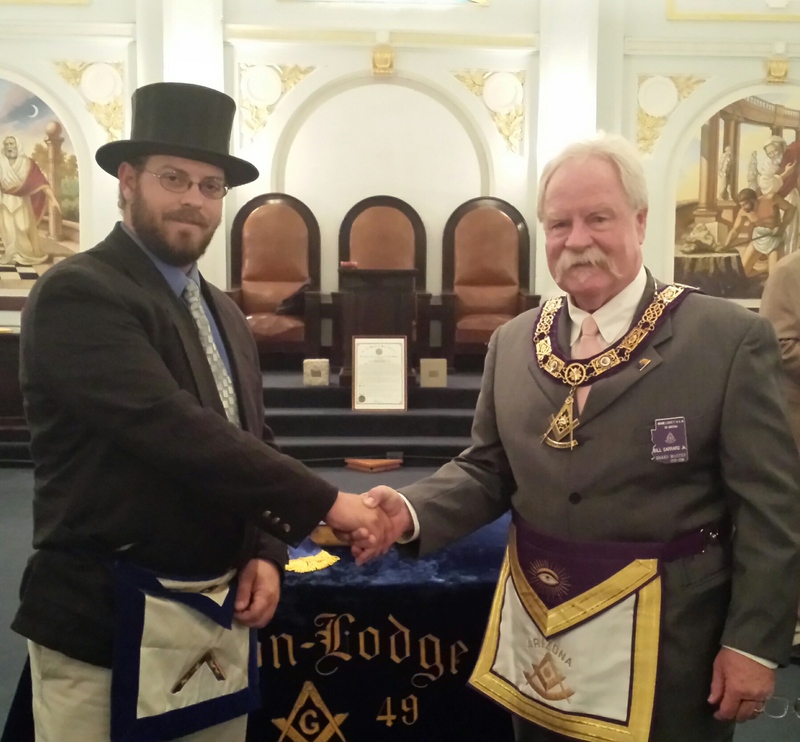 Last night (10/28/15) with the help of a few brothers from lodges around Tucson, Aaron Lodge initiated a new Brother, Tony Williams to our fraternity. Bro. Tony is the Brother-in-Law of Bro. Warren Shatilly, who also sat as the Junior Deacon for the degree and presented the Apron lecture along with his new apron. On 9/26 we had a great time at Reid Park for the Aaron Lodge 60th Year Reunion picnic and want to thank all the Brothers and their families that came out to support the Lodge. It was great to see some new faces and some we haven’t seen in quite a while, so we’re planning to continue the tradition next year as well. Aaron Lodge also has some upcoming events that might be of interest to you. 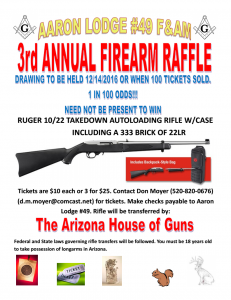 Come out and support your Lodge! I would like to welcome everybody back to Lodge after our summer break. I hope that everybody spent some quality time with their families and got some much needed relaxation. We have some important event coming up in the next few months. October 1st at our Stated meeting we have an official visitation from our Grand Master MW Brother Mike Manning. I encourage everybody to come down to Aaron Lodge and meet our Grand Master and enjoy some fellowship with all the Brothers from Aaron and other Lodges. 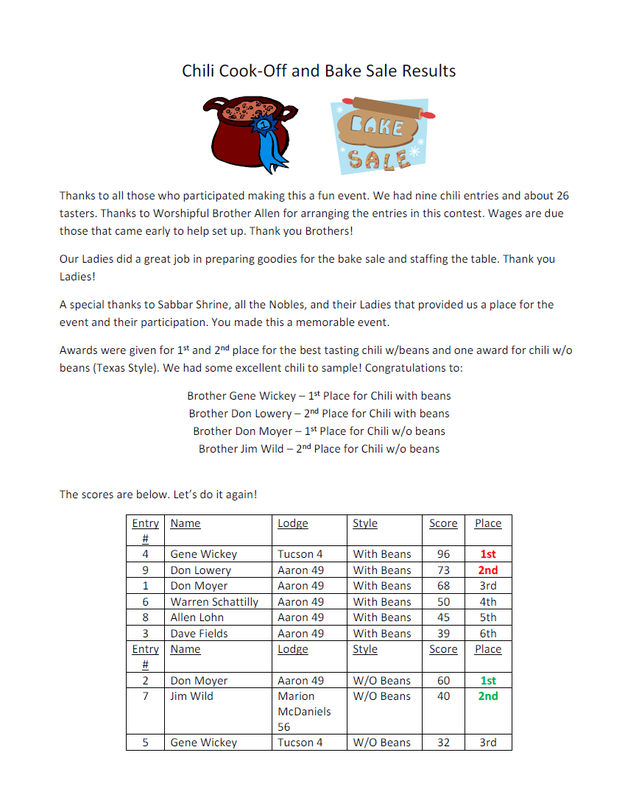 We also have a couple of Second Degrees coming up, our annual chili cook-off, some discussions and Third Degree work as well, and that is just in October. November will be filled with more Degrees, another visitation from Grand Lodge and Officer Elections. I hope to see everybody back in Lodge and I am looking forward to meeting some new Brothers that have not been to Lodge in a while. Aaron Lodge #49 F. &A.M.
A committee has been elected and we are making a serious effort to keep the website (www.tucsonaaronlodge49.org) updated. Thanks to Brother Don Lowery for all his efforts! I am sad to say that we lost two wonderful Brothers over the last few months. Morris Segal, PM passed away on 5/20/2014 and Darrell Gillis, PM on 8/15/2014. A Masonic funeral was requested and performed on 8/21/2014 for Worshipful Brother Gilles by Right Worshipful Brother J. Michael Atchley, DGM, Worshipful Brother Bobbie Creech, and myself. Thank you J. Michael for a very nice presentation. Others in attendance from Aaron Lodge #49 were Lawrence Behers, PM, Joseph Leininger, PM, and Justin Fisher. Thanks you Brothers for being there. Our Rusty Nail Degree and presentation of longevity awards on 4/10/2014 went over very well. Most Worshipful Brother William A. Garrard, Jr., GM (now PGM) was present to hand out awards. We also put the GM in a chair for the Rusty Nail and he did a great job on the Apron Lecture! We have two new Entered Apprentices, Emmet Sweat and Warren Schattilly, who are looking forward towards their Fellow Craft Degrees. These dates are listed below in Lodge activities. 9/10/14 – 6 PM snack. 7 PM Walk through of the 1st Degree for the two Brothers that just went through it. 10/1/14 – 6 PM dinner. 7 PM Stated meeting with OV by Most Worshipful Brother Mike Manning, Grand Master of Free & Accepted Masons in Arizona. We need our Brothers to get active again and help with the Degree work. We can find you a spot for you, even if you can’t do ritual, on the floor or on the sidelines. Come out and show support for our new Masons! I look forward to seeing you at one of our next events! Wow! We have an active website again. 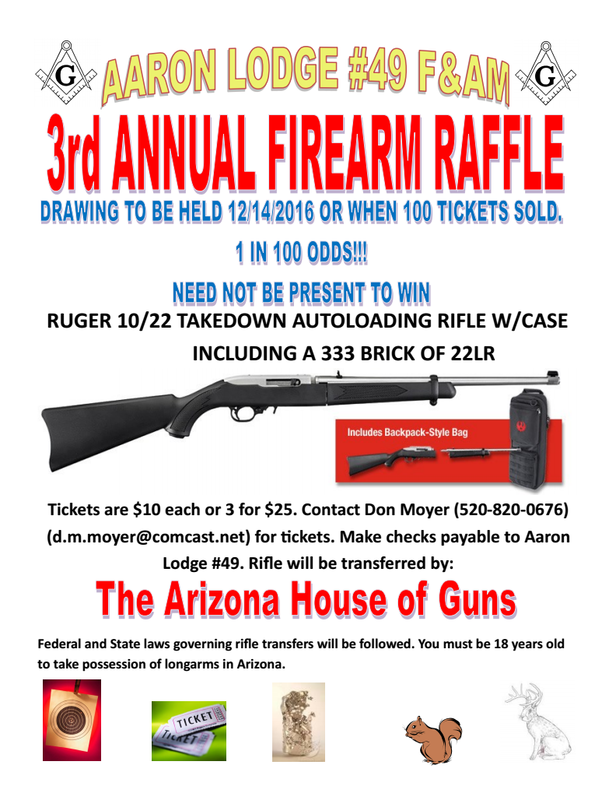 www.tucsonaaaronlodge49.org Thanks to Brother Don Lowery we can again publish. We also have some catching up to do. Congratulations to Miguel Guzman who was passed to the degree of Fellowcraft on February 13th, 2013. We are looking forward to his proficiency and being raised to the sublime degree of Master Mason! 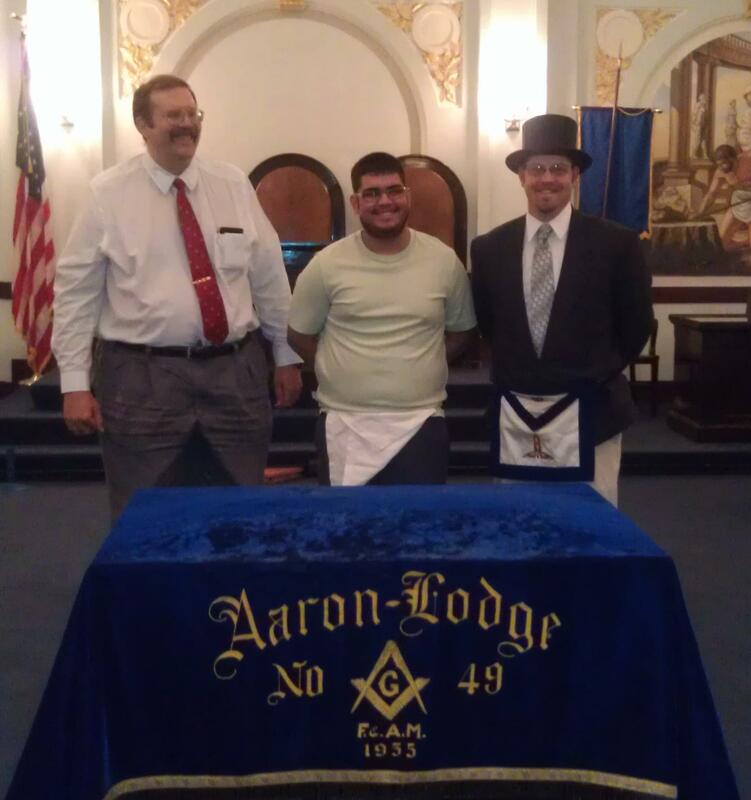 Brother Keith Krasny became a member of Aaron Lodge on February 6th, 2013. We are pleased to have him. Aaron Lodge has gone back to having dinner supplied by the Lodge with donations requested. This has been going well. Bring your lady, children, and friends! You lady will appreciate not having to cook, serve, or clean. The men take care of clean-up. Thanks to WB Bob Brown for getting this going again. May 1st we will be having lemon pepper chicken. 5/24 – Widow’s Luncheon at Mimi’s Cafe. We will get more dates up on the calendar ASAP now that we are back up and running. Join the many Masons receiving our newsletter! Copyright Aaron Lodge © 2019. All Rights Reserved.